Schwartz & Wade, 9780375858871, 40pp. On August 28, 1963, on the steps of the Lincoln Memorial during the March on Washington, Martin Luther King gave one of the most powerful and memorable speeches in our nation's history. His words, paired with Caldecott Honor winner Kadir Nelson's magnificent paintings, make for a picture book certain to be treasured by children and adults alike. 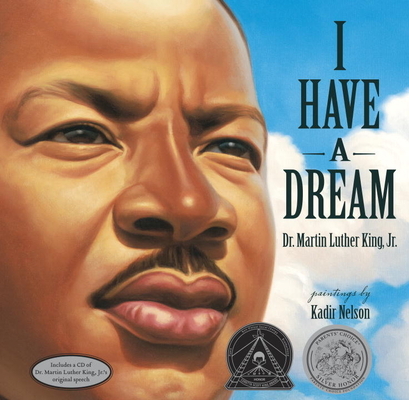 The themes of equality and freedom for all are not only relevant today, 50 years later, but also provide young readers with an important introduction to our nation's past. Included with the book is an audio CD of the speech. MARTIN LUTHER KING, JR. (January 15, 1929-April 4, 1968) was a clergyman, activist, and prominent leader in the American civil rights movement. In 1964, King became the youngest person to receive the Nobel Prize for his work to end racial segregation and discrimination through nonviolent means. KADIR NELSON is the acclaimed illustrator of Moses: When Harriet Tubman Led Her People to Freedom and Henry's Freedom Box: A True Story from the Underground Railroad, both Caldecott Honor books. His other titles include We Are the Ship, a Robert F. Sibert Medal winner and Coretta Scott King Award recipient, and Heart and Soul: The Story of America and African-Americans. "This picture book stands a notch above others thanks to Caldecott Honor winner Kadir Nelson's beautifully rendered and sincerely moving paintings."